King Ashoka, who many believe was an early convert to Buddhism, decided to solve these problems by erecting pillars (Ashok Stambh) that rose some 50’ into the sky. The pillars were raised throughout the Magadha region in the North of India that had emerged as the center of the Indian empire, the Mauryan Dynasty (322-185 B.C.E). Written on these pillars, intertwined in the message of Buddhist compassion, were the merits of King Ashoka. One of Ashoka’s first artistic programs was to erect the pillars that are now scattered throughout what was the Mauryan empire. The pillars vary from 40 to 50 feet in height. They are cut from two different types of stone—one for the shaft and another for the capital. The shaft was almost always cut from a single piece of stone. Laborers cut and dragged the stone from quarries in Mathura and Chunar, located in the northern part of India within Ashoka’s empire. The pillars weigh about 50 tons each. Only 19 of the original pillars survive and many are in fragments. The first pillar was discovered in the 16th century. The physical appearance of the pillars underscores the Buddhist doctrine. Most of the pillars were topped by sculptures of animals. Each pillar is also topped by an inverted lotus flower, which is the most pervasive symbol of Buddhism. A lotus flower rises from the muddy water to bloom unblemished on the surface—thus the lotus became an analogy for the Buddhist practitioner as he or she, living with the challenges of everyday life and the endless cycle of birth and rebirth, was able to achieve Enlightenment, or the knowledge of how to be released from samsara, through following the Four Noble Truths. This flower, and the animal that surmount it, form the capital, the topmost part of a column. Most pillars are topped with a single lion or a bull in either seated or standing positions. The Buddha was born into the Shakya or lion clan. The lion, in many cultures, also indicates royalty or leadership. The animals are always in the round and carved from a single piece of stone. Some pillars had edicts (proclamations) inscribed upon them. The edicts were translated in the 1830s. 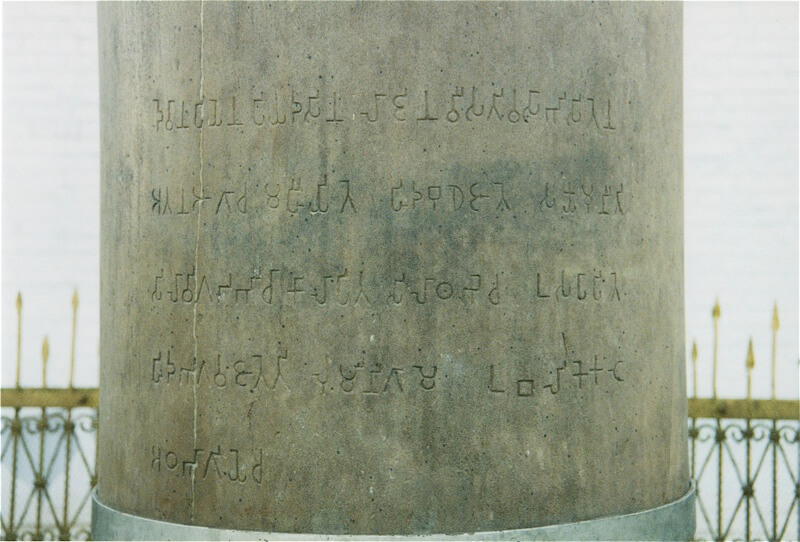 Since the 17th century, 150 Ashokan edicts have been found carved into the face of rocks and cave walls as well as the pillars, all of which served to mark his kingdom, which stretched across northern India and south to below the central Deccan plateau and in areas now known as Nepal, Pakistan, Bangladesh, and Afghanistan. The rocks and pillars were placed along trade routes and in border cities where the edicts would be read by the largest number of people possible. They were also erected at pilgrimage sites such as at Bodh Gaya, the place of Buddha’s Enlightenment, and Sarnath, the site of his First Sermon and Sanchi, where the Mahastupa, the Great Stupa of Sanchi, is located (a stupa is a burial mound for an esteemed person. When the Buddha died, he was cremated and his ashes were divided and buried in several stupas. These stupas became pilgrimage sites for Buddhist practitioners). The pillars (and the stupas) were created in the Hinayana (Lesser Vehicle) period. Hinayana is the first stage of Buddhism, roughly dated from the sixth c. to the first century B.C.E., in which no images of the Buddha were made. The memory of the historical Buddha and his teachings was enough to sustain the practitioners. But several symbols became popular as stand-ins for the human likeness of the Buddha. The lotus, as noted above, is one. 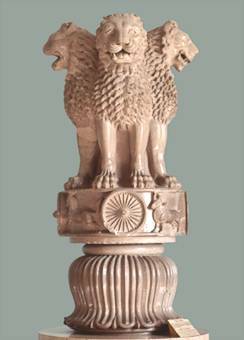 The lion, which is typically seen on the Ashokan pillars, is another. The wheel (chakra) is a symbol of both samsara, the endless circle of birth and rebirth, and the dharma, the Four Noble Truths.